This document introduces custom Estimators. In particular, this document demonstrates how to create a custom tf.estimator.Estimator that mimics the behavior of the pre-made Estimator tf.estimator.DNNClassifier in solving the Iris problem. See the Pre-Made Estimators chapter for details on the Iris problem. If you are feeling impatient, feel free to compare and contrast custom_estimator.py with premade_estimator.py. (which is in the same directory). Pre-made and custom Estimators are all Estimators. Pre-made Estimators are fully baked. Sometimes though, you need more control over an Estimator's behavior. That's where custom Estimators come in. You can create a custom Estimator to do just about anything. If you want hidden layers connected in some unusual fashion, write a custom Estimator. If you want to calculate a unique metric for your model, write a custom Estimator. Basically, if you want an Estimator optimized for your specific problem, write a custom Estimator. With pre-made Estimators, someone already wrote the model function for you. With custom Estimators, you must write the model function. Your model function could implement a wide range of algorithms, defining all sorts of hidden layers and metrics. Like input functions, all model functions must accept a standard group of input parameters and return a standard group of output values. Just as input functions can leverage the Dataset API, model functions can leverage the Layers API and the Metrics API. Our implementation of Iris contains four features, two hidden layers, and a logits output layer. 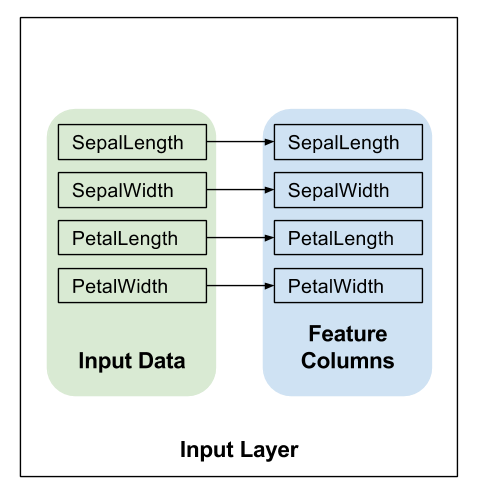 This input function builds an input pipeline that yields batches of (features, labels) pairs, where features is a dictionary features. As detailed in the Premade Estimators and Feature Columns chapters, you must define your model's feature columns to specify how the model should use each feature. Whether working with pre-made Estimators or custom Estimators, you define feature columns in the same fashion. The first two arguments are the batches of features and labels returned from the input function; that is, features and labels are the handles to the data your model will use. The mode argument indicates whether the caller is requesting training, predicting, or evaluation. The caller may pass params to an Estimator's constructor. Any params passed to the constructor are in turn passed on to the model_fn. In custom_estimator.py the following lines create the estimator and set the params to configure the model. This configuration step is similar to how we configured the tf.estimator.DNNClassifier in Premade Estimators. The preceding line applies the transformations defined by your feature columns, creating the model's input layer. The units parameter defines the number of output neurons in a given layer. 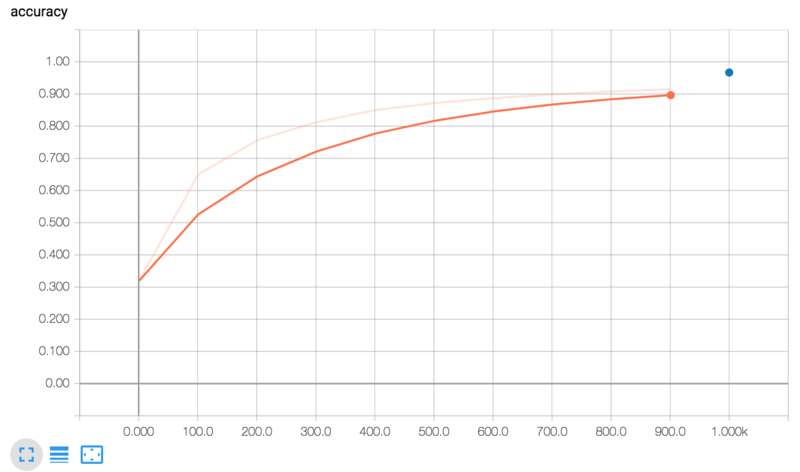 The activation parameter defines the activation function — Relu in this case. The variable net here signifies the current top layer of the network. 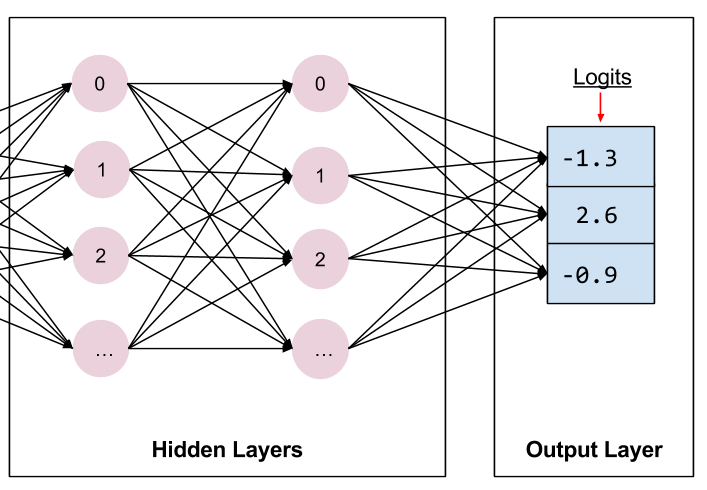 During the first iteration, net signifies the input layer. On each loop iteration tf.layers.dense creates a new layer, which takes the previous layer's output as its input, using the variable net. After creating two hidden layers, our network looks as follows. For simplicity, the figure does not show all the units in each layer. Note that tf.layers.dense provides many additional capabilities, including the ability to set a multitude of regularization parameters. For the sake of simplicity, though, we're going to simply accept the default values of the other parameters. The final hidden layer feeds into the output layer. When defining an output layer, the units parameter specifies the number of outputs. So, by setting units to params['n_classes'], the model produces one output value per class. Each element of the output vector will contain the score, or "logit", calculated for the associated class of Iris: Setosa, Versicolor, or Virginica, respectively. Later on, these logits will be transformed into probabilities by the tf.nn.softmax function. The final step in creating a model function is to write branching code that implements prediction, evaluation, and training. The Estimator framework then calls your model function with mode set to ModeKeys.TRAIN. Your model function must provide code to handle all three of the mode values. For each mode value, your code must return an instance of tf.estimator.EstimatorSpec, which contains the information the caller requires. Let's examine each mode. When the Estimator's predict method is called, the model_fn receives mode = ModeKeys.PREDICT. In this case, the model function must return a tf.estimator.EstimatorSpec containing the prediction. The model must have been trained prior to making a prediction. The trained model is stored on disk in the model_dir directory established when you instantiated the Estimator. The prediction dictionary contains everything that your model returns when run in prediction mode. class_ids holds the class id (0, 1, or 2) representing the model's prediction of the most likely species for this example. We return that dictionary to the caller via the predictions parameter of the tf.estimator.EstimatorSpec. The Estimator's tf.estimator.Estimator.predict method will yield these dictionaries. For both training and evaluation we need to calculate the model's loss. This is the objective that will be optimized. We can calculate the loss by calling tf.losses.sparse_softmax_cross_entropy. The value returned by this function will be approximately 0 at lowest, when the probability of the correct class (at index label) is near 1.0. The loss value returned is progressively larger as the probability of the correct class decreases. This function returns the average over the whole batch. When the Estimator's evaluate method is called, the model_fn receives mode = ModeKeys.EVAL. In this case, the model function must return a tf.estimator.EstimatorSpec containing the model's loss and optionally one or more metrics. eval_metric_ops, which is an optional dictionary of metrics. The tf.summary.scalar will make accuracy available to TensorBoard in both TRAIN and EVAL modes. (More on this later). When the Estimator's train method is called, the model_fn is called with mode = ModeKeys.TRAIN. In this case, the model function must return an EstimatorSpec that contains the loss and a training operation. Building the training operation will require an optimizer. We will use tf.train.AdagradOptimizer because we're mimicking the DNNClassifier, which also uses Adagrad by default. The tf.train package provides many other optimizers—feel free to experiment with them. Next, we build the training operation using the optimizer's tf.train.Optimizer.minimize method on the loss we calculated earlier. The minimize method also takes a global_step parameter. 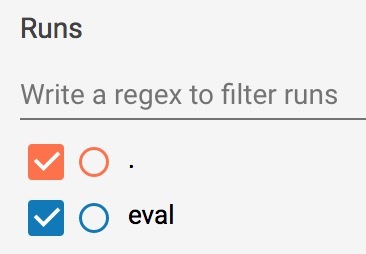 TensorFlow uses this parameter to count the number of training steps that have been processed (to know when to end a training run). Furthermore, the global_step is essential for TensorBoard graphs to work correctly. Simply call tf.train.get_global_step and pass the result to the global_step argument of minimize. loss, which contains the value of the loss function. train_op, which executes a training step. The model function is now complete. Here the params dictionary serves the same purpose as the key-word arguments of DNNClassifier; that is, the params dictionary lets you configure your Estimator without modifying the code in the model_fn. global_step/sec: A performance indicator showing how many batches (gradient updates) we processed per second as the model trains. 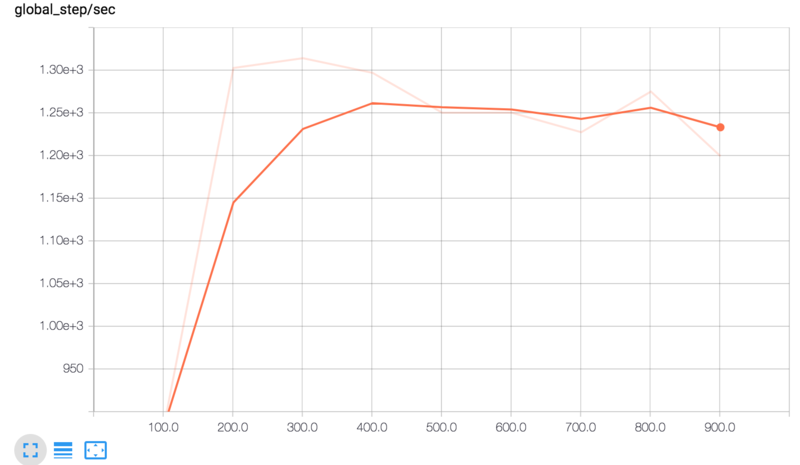 These tensorboard graphs are one of the main reasons it's important to pass a global_step to your optimizer's minimize method. The model can't record the x-coordinate for these graphs without it. The orange line represents training. The blue dot represents evaluation. 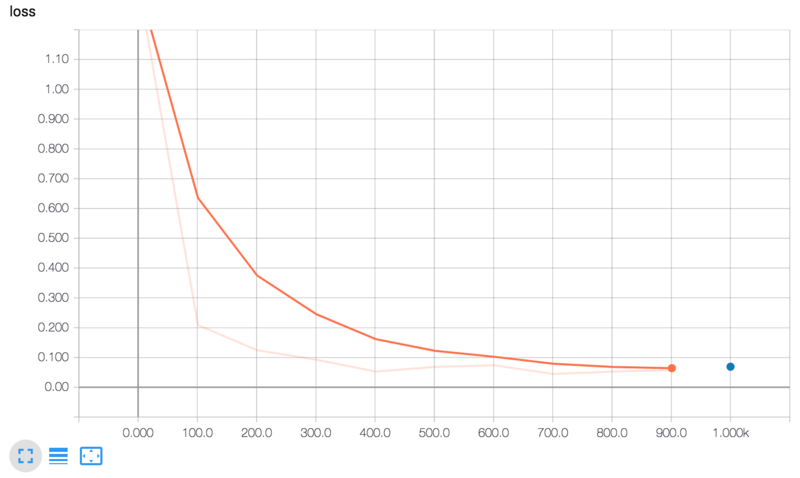 During training, summaries (the orange line) are recorded periodically as batches are processed, which is why it becomes a graph spanning x-axis range. By contrast, evaluation produces only a single point on the graph for each call to evaluate. This point contains the average over the entire evaluation call. This has no width on the graph as it is evaluated entirely from the model state at a particular training step (from a single checkpoint). As suggested in the following figure, you may see and also selectively disable/enable the reporting using the controls on the left side. Although pre-made Estimators can be an effective way to quickly create new models, you will often need the additional flexibility that custom Estimators provide. Fortunately, pre-made and custom Estimators follow the same programming model. The only practical difference is that you must write a model function for custom Estimators; everything else is the same. The official TensorFlow implementation of MNIST, which uses a custom estimator. 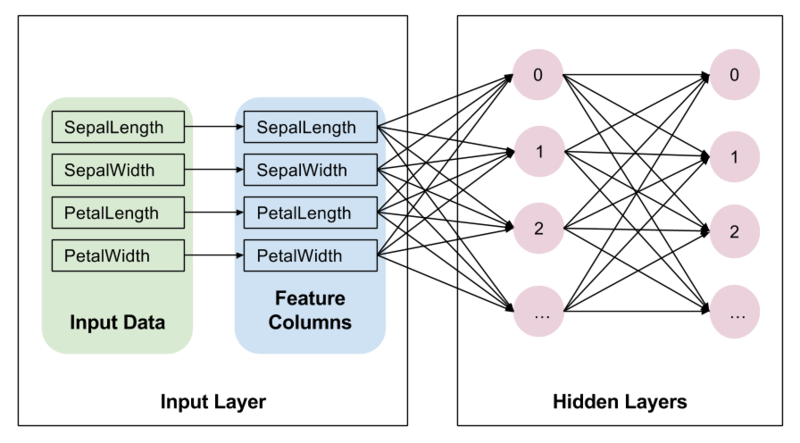 The TensorFlow official models repository, which contains more curated examples using custom estimators. This TensorBoard video, which introduces TensorBoard. The Low Level Introduction, which demonstrates how to experiment directly with TensorFlow's low level APIs, making debugging easier.